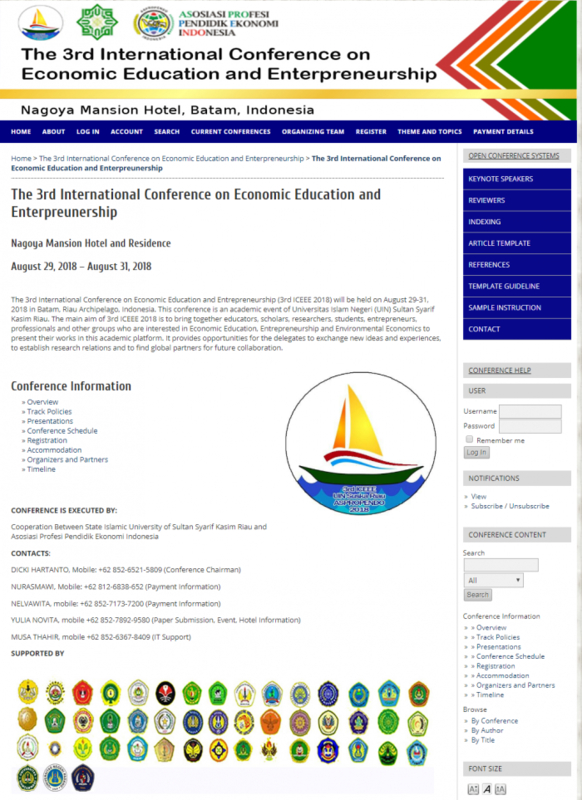 The 3rd International Conference on Economic Education and Entrepreneurship (3rd ICEEE 2018) will be held on August 29-31, 2018 in Batam, Riau Archipelago, Indonesia. This conference is an academic event of Universitas Islam Negeri (UIN) Sultan Syarif Kasim Riau. The main aim of 3rd ICEEE 2018 is to bring together educators, scholars, researchers, students, entrepreneurs, professionals and other groups who are interested in Economic Education, Entrepreneurship and Environmental Economics to present their works in this academic platform. It provides opportunities for the delegates to exchange new ideas and experiences, to establish research relations and to find global partners for future collaboration. © 2018. Hak Cipta Aspropendo Bidang Pengembangan TIK.